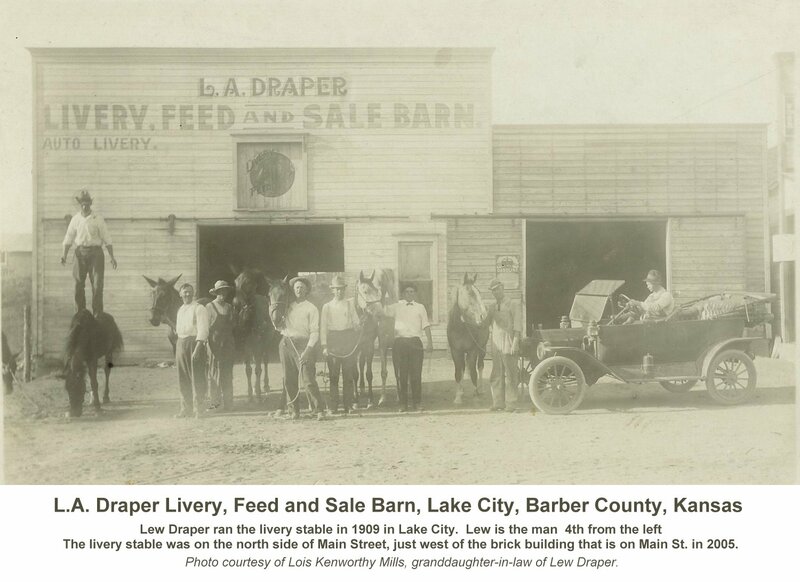 L.A. Draper Livery, Feed and Sale Barn, Lake City, Barber County, Kansas, early 1900s. Lew Draper is the 4th man from the left in this photo. The livery stable was on the north side of Main Street, just west of the brick building that is on Main St. in 2005. Photo courtesy of Lois Kenworthy Mills, granddaughter-in-law of Lew Draper and Ada (Laury) Draper. Plot Map of Lake City, Barber County, Kansas. From the 'Standard Atlas of Barber County Kansas', 1905. View a much larger image of this map. Lake City. Laid out in 1874, on Medicine Lodge river, in Lake City township, Barbour county, 18 miles from Medicine Lodge (ch), and 67 air line from Hutchinson, its shipping point on the AT&SF RR. It has a Methodist society, a public school, and 40 inhabitants. Stages to Medicine Lodge tri-weekly, far $1; to Hutchinson, for $5.50. Mail, tri-weekly Reuben Lake, postmaster. Lake City. On Medicine Lodge river, and on the SK Ry, in Barber county, 18 miles from Medicine Lodge, the county seat and bank location. It has a church, a public school, several stores and a weekly newspaper, The Kansas Prairie Dog. Stages to Medicine Lodge and Sun City. Exp., Wells Fargo & Co. Tel, W.U. Population 300. Reuben Lake, postmaster. Lake City, the site of it rather, was discovered by Reuben Lake in April, 1873. It is situated in Lake township, in the heart of the stock region, eighteen miles northwest of Medicine Lodge, with which is connected by a daily stage and mail line. Its natural location is all that could be desired. In a deep valley, backed on the north by the bluff that rises above it, with the Medicine River, fringed with a dense growth of forest trees on the south, it is very beautiful. In the early eighties, Lake had great prospects, and was a busy, bustling village of 350 inhabitants and came about as near making itself solid for the future as any of the numerous towns that started during that eventful period. It got so far along even, that the Santa Fe Co. projected a line of railroad from Medicine Lodge to Lake, secured the right of way and completed the grade. Then something happened, we do not know exactly what, anyway the work was abandoned and the metropolitan hopes of Lake City vanished. Perhaps it is just as well, it is a good town anyway, one of the best trading points in the county. Has two large business houses and a blacksmith shop, all that is needed to supply the wants of the town and the community surrounding it. It has a fine school building and there are many fine residences. The Masonic order is represented here and is perhaps the strongest lodge in Barber county, numerically and financially, having a membership of forty and a surplus fund of $500 in the treasury. The M.W.A. [probably Modern Woodmen of America] is also represented by a membership of eighteen. The hospitality of the people is unbounded and the latch string always hangs out. 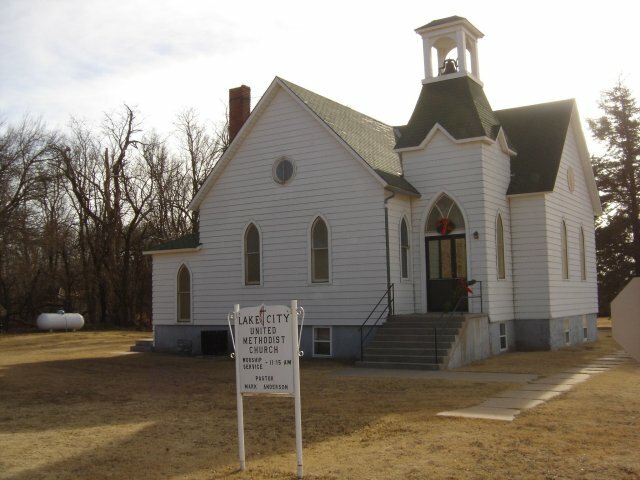 Lake City Methodist Church on the east side of Lake City, Kansas, looking south. Photo by Nathan Lee, 15 December 2006. 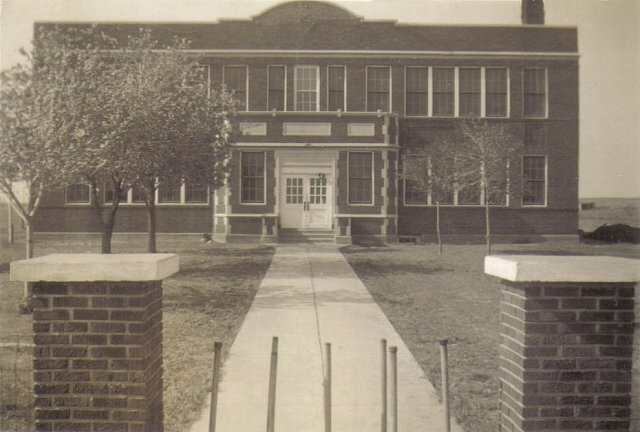 Lake City School, Lake City, Barber County, Kansas. Photo by Kim Fowles, 2005. The Hoagland Ranch near Lake City, Barber County, Kansas. Photo courtesy of Ronnie Hoagland of The Oak Creek Ranch. Thanks to Kim Fowles for arranging permission to use this photograph. This RootsWeb website is being created by Jerry Ferrin with the able assistance of many Contributors. Your comments, suggestions and contributions of historical information and photographs to this site are welcome. Please sign the Guest Book. This page was last updated 14 June 2008.